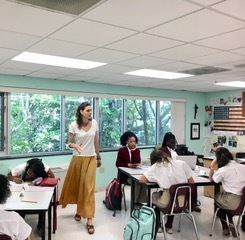 The Bishop McNamara Visual Arts Program provides opportunities for our students to develop their understanding and appreciation of the visual by exposing students to sculpture and ceramics, computer graphics, painting, photography, graphic arts, mechanical drawing, art history and internet web page design. We offer a wide selection of visual art courses designed with college-bound students in mind. Whether taught in the studio or computer labs, these courses focus on skills like composition building/layout, elements and principles of design, mastery of materials, and with an emphasis on observational drawing skills. We provide students with an opportunity to experiment with a variety of media and materials using hands-on strategies and emerging technologies. In addition, we offer Advanced Placement courses and other portfolio development opportunities. Our visual arts program is built on the understanding that exploration through visual art not only enriches a child's scope and view of the world, but also engages high order thinking skills which are crucial for problem solving and achievement. Our students' art is posted at Artsonia.com - an online museum of art for students.